It’s an allusion to the fact that (besides updates to its software), the device can periodically refresh its content. Sharp’s press release emphasized its “Automatic Scheduled Delivery Service” for newspapers and magazines, though “The first models have Wi-Fi but don’t come equipped with 3G wireless,” notes IDG. And they also report that while there’s some Android apps pre-installed, “users might not be able to download additional apps.” In fact, a careful study of the press release reveals many shortcomings. 1. 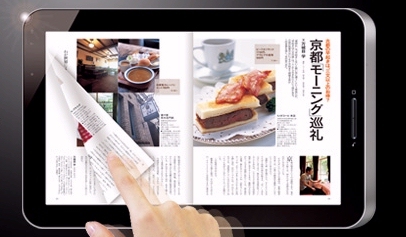 Sharp promises a total of just 30,000 newpapers, magazines, and ebooks. (Whereas Amazon’s Kindle Store offers 700,000). 2. Sharp didn’t announce its price. 3. It’s got a standard LCD display, rather than the more comfortable e-ink. But most importantly, Sharp’s press release promises “a network service and device specifically designed for the Japanese market.” This means that it fully supports Japanese characters, but the device is based on the XMDF document format, according to IDG, “a format developed by Sharp and largely confined to Japan”. I think it’s significant that the device comes pre-installed with a “social network service” for sharing comments and lists of ebooks. 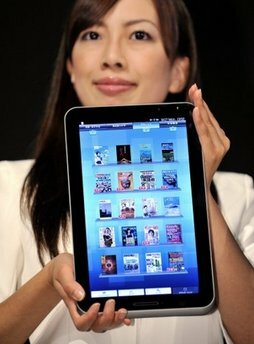 Text messaging is extremely popular in Japan, but it’s not necessarily a must-have feature for a digital reader. 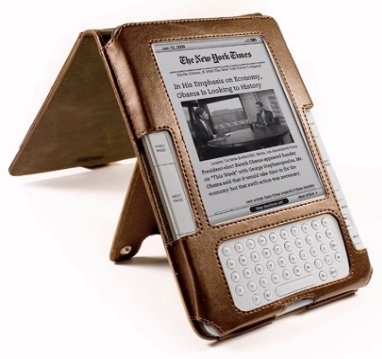 There’s two models – one the size of a Kindle, and one the size of an iPad — and the cases come in two colors, red and silver. (Though the larger models are only available in black). But ultimately, I have the same reaction that I did when Apple released the iPad. It just shows that all around the world, people are still very excited about the reader market!